WASHINGTON – As the Catholic Church observed National Migration Week Jan. 3-9, support for legislative efforts took the forefront amid various other steps to bring attention to the concerns of migrants and refugees. In a teleconference Jan. 6, Bishop John C. Wester of Salt Lake City, chairman of the bishops’ Committee on Migration, described several steps being undertaken by the U.S. bishops, including a new Web site, a nationwide action alert and a previously announced postcard campaign to encourage members of Congress to support comprehensive reform. 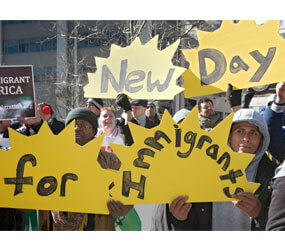 The Web site is a revamped version of www.justiceforimmigrants.org. “The American public, including the Catholic and other faith communities, want a humane and comprehensive solution to the problems which beset our immigration system, and they want Congress to address this issue,” Bishop Wester said. Bishop Howard J. Hubbard of Albany, N.Y., chairman of the Committee on International Policy, said the bishops also want the legislation to address the root causes of migration and help enable people to make a decent living in their own countries. Also in the teleconference, Sister Rita Mary Harwood, a Sister of Notre Dame who heads the Office of Parish Life and Development in the Diocese of Cleveland, said the church in Ohio will distribute nearly 300,000 postcards that will be sent to Congress. She said she sees in Ohio many parallels between the migrants of past generations and those of today and hopes that reminding the public of those similarities will open hearts so that people will back immigration reform. Sister Mary Beth Hamm, justice coordinator of the Sisters of St. Joseph in Philadelphia, said making sure the public hears the stories of individual immigrants is the key to what her order is doing to support immigration reform. “You can’t hate the person whose story you know,” she said. Elsewhere around the country, Catholic, interfaith and nonreligious groups small and large held immigration-related events. They ranged from press conferences, simple prayer services and educational events to a walk from Miami to Washington by four students hoping to bring attention to the situations they and others face. The four current or former students at Miami-Dade Community College planned to walk to Washington to draw attention to the problem of students who are in the United States illegally through no fault of their own, brought into the country by their parents when they were young. Without legal status they are barred in many states from obtaining lower in-state tuition rates, making it impossible for many to attend college. Legislation that would open a path to legalization and U.S. citizenship for tens of thousands of such students has long had broad public and congressional support but efforts to pass the bill repeatedly have been shelved. In Chicago, priests, sisters and brothers representing more than 37 religious orders planned a prayer service and press conference at Holy Name Cathedral Jan. 8 to call for passage of comprehensive immigration reform. The priests and religious planned to commit to a calendar of days to pray and fast over the next three months in support of the legislative effort.